When he sees his cabin at Camp Half-Blood, filled with power tools and machine parts, he feels right at home. But there’s weird stuff, too—like the curse everyone keeps talking about, and some camper who's gone missing. Weirdest of all, his bunkmates insist that each of them—including Leo—is related to a god. Does this have anything to do with Jason's amnesia or the fact that Leo keeps seeing ghosts? The narrator was awesome and his voice didn't annoy me! He also had really distinctive voices for each character which made it easy to follow. It's a full-length novel and super lengthy considering it's a middle-grade / YA book! Nah, the story arc for this book wraps up but obviously, the overarching plot is unresolved. Yep, fantasy violence suitable for YA readers. Argh! This book made me so happy and I never expected that to happen... Honestly, one of the reasons I held off in starting this series for so long was that I loved the Percy Jackson series and was less than enthused at the idea of a lengthy book set in the world of Percy Jackson but without Percy! What kind of evil was that! A whole new set of heroes?! A son of Zeus? Give me the son of the sea god any day! However, the kiddo loved this series and Percy returns in the next book so I eventually had a word with myself and gave the series a try and now I'm kicking myself that I waited so long! 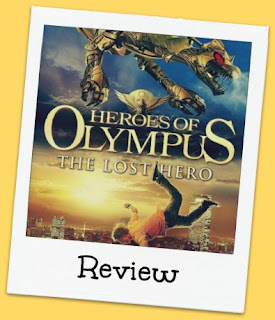 It has everything I came to love about Rick Riordan's world - amazing characters, a gripping story, myths, legends, feeling, laugh out loud humor - and more! Jason (son of Zeus/Jupiter), Piper (daughter of Aphrodite) and Leo (son of Hephestus) stole my flipping heart. The camp half-blood crew make an appearance, the hunters of Artemis are present, there's a flying bronze dragon, minor gods, evil plots, a whole new prophesy and new aspects to the Gods! 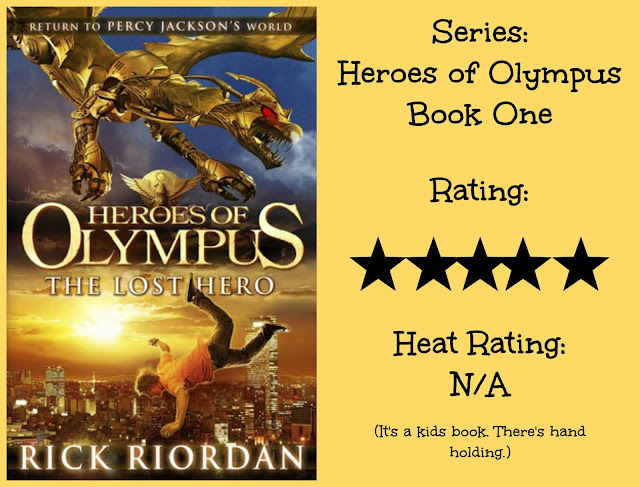 It was exciting and addictive and in many ways much more grown up than the Percy Jackson series. The characters had experienced heartbreak, they'd had uneasy childhoods, they had to make tough decisions, they were conflicted and being herded down a path by a bitchy Goddess that they weren't sure they wanted to walk but they stepped up to the plate to do what was right anyway. I loved that it was told from multiple points of view. It really helped to develop each of the new characters and flesh out their stories to the point that they felt like real people and my god did you care about what happened to them! I love the direction the world is going and I'm so excited to read The Son of Neptune now, not just to reconnect with Percy (I love him!) but to meet Camp Jupiter and the Roman demi-gods. I desperately want to know who will finish off the list of 7 heroes to enact the prophecy (Percy is obviously one but who else?) and you know what? It's a testament to Rick Riordan that no matter how excited I am to be returning to Percy, I'm a little annoyed I need to wait until book three to see Jason, Piper and Leo again and for the characters to unite! Meh, the cover is fine. I love that it features Festus the dragon. “Uh, sure.” Jason hoped he wasn’t blushing. I've read a couple of books that were told from multiple views and I liked that. This sounds fun. It was so much fun! I seriously have so much love for this author and this world. I love Rick Riordan! I've only read the Percy Jackson series, but I really want to read more. Glad it was a good one! The Percy Jackson series is so good, isn't it? These sound so fun! I've never read any of his books but I've wanted to try em for ages. Maybe this will be the year I take the plunge. I like too that he doesn't write down or write shorter books for kids. They're great Greg! You should definitely give them a try. This sounds like a fun MG book. I didn't think I would like MG but after reading City of Ghosts, I found that I really do. I will have to add this one as your review has made me really want to pick this one up on audio! I liked the Percy Jackson world and the plots were good. Loved those party horses! I just found that Annabeth in particular got too whiny and when the teen angst love element came in I lost interest which was a shame! Annabeth isn't my fav person either but I adore Percy and with this series there are so many new lovable characters. This series is fantastic too, actually, all the Riordan books are! But it's a good idea to pause a bit between them so you can 'cleanse your palate' and enjoy the new characters and setting. I had quite a long break between Percy Jackson and the Heroes books and I think it was definitely a good move but I can also understand why my little dude just binged the entire back catalogue of Rick Riordan in the space of 8 months as his writing is so fun and so easy to escape into!